Rabbi Yitzhak Yosef says haredim do serve in the army, slams IDF for forcing men to listen to women singing. 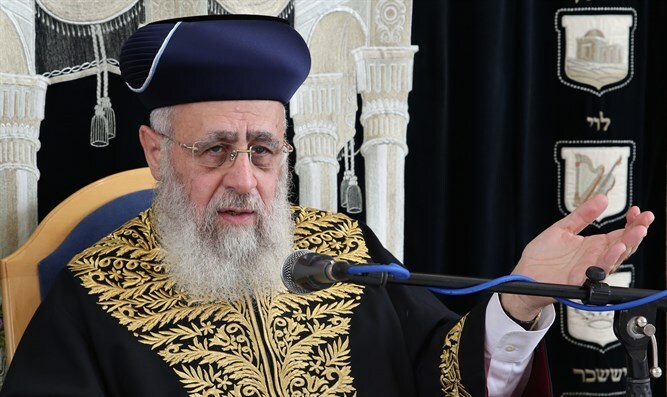 Sephardic Chief Rabbi Yitzhak Yosef in a Torah class slammed the IDF's insistence soldiers listen to women singing and the media's portrayal of haredim as not drafting into the IDF at all, Kikar Hashabbat reported. "There is incitement," Rabbi Yosef said, adding that the media portrays it "as if haredim don't serve in the army [at all]." "Obviously," he added, "I am referring to those who draft into the IDF and do not become less religious as a result... I am not talking about those who, G-d forbid, go to the army and become secular." "Why are we here in Jerusalem? Because of the army? I honor the army - they are G-d's emissaries - but without the Torah and yeshiva students, could anyone stand up to our enemies? If there were no yeshiva students learning Torah constantly, who could stand up to Hezbollah's plans?" Rabbi Yosef also slammed the IDF's orders that religious soldiers attend ceremonies in which women sing. "You need to hear women singing, but why is this an army command?" he asked. "There's an order to hear women singing, why is it part of the army's orders? What happened? Is this part of the training? Is this part of the orders? A few commanders I spoke to told me that 'there is an IDF order to hear women sing.' How is this order connected to anything? If there was no immodesty in the army, who knows how much more successful they would be. It's unfortunate." In May, Rabbi Yosef ruled during his weekly Torah class that IDF soldiers who were forced to hear women singing at an event should take a book, take off their glasses, and show that they are learning Torah instead of listening to the singing.